In other sports – such as golf – the main way of ranking athletes is by the amount of prize money they make. 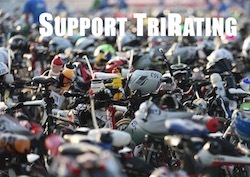 With all the data from the qualifying races, I’ve built one for Ironman Triathlons. It is also a convenient way of putting men and women in the same list. Obviously, this does not include money from IM Hawaii as this would seriously skew the data. Also, IM 70.3 races are not included. There are fewer women overall on the money list than men (105 female vs. 121 male). Therefore it seems to be easier to earn some money – there were even a few races (IM Korea comes to mind) where not all price money was handed out for lack of eligible pro women in the race. With the number of women in the TOP20 list above, it also seems to be easier for a woman to earn price money. I think this is mainly caused by fewer women battling for money, so you have a better chance to earn decent money when starting in a couple of races. But can you live from it? So it seems to be a good idea to become a Pro when you’re a women – but then I would be very surprised if the prize money from IM races is sufficient for any athlete to live from it. Especially after adding in the travel costs there won’t be too much money left. Also, every Pro athlete has to pay a pro fee to WTC (if I remember correctly 750$). It is always hard to compare athletes between different sports, but in golf the Top 99 athletes on the money list earn more than 1 million dollars – triathlon still has a long way to go before reaching that level of money! It would be interesting to see how much money people were able to make from 70.3s, but the larger number of races is offset by the usual smaller prize money – so I’d be surprised if a significant number of athletes makes more than a few thousand dollars. Other (even long distance) races exist, maybe even paying decent prize money – but again, I don’t think that this will be a main source of income. So how can people survive doing long course triathlons? Other than a select few top athletes, I don’t think that appearance money plays a significant role. The same is true for sponsorship money – the typical athletes will probably mostly get “paid” in free product, rather than money. So unless you are a TOP 10 in Kona, I don’t think you can live from long course triathlon. And unless you win in Kona, I don’t think there’ll be much money left over after your career to retire from or even to live comfortably for a few years. Economically, your time will be better spent going to a decent university and getting your professional career started in a traditional “desk job”. But who wouldn’t rather train all day?